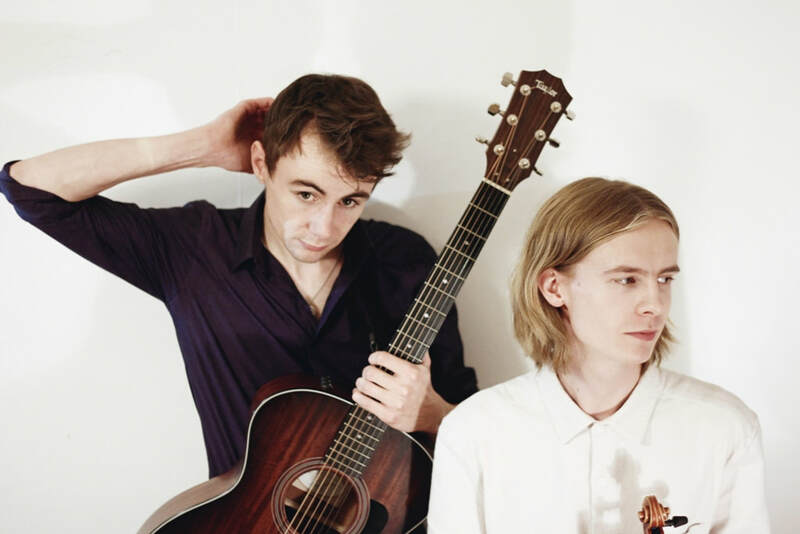 Alex Garden (fiddle, vocals) and Ford Collier (guitar, tin whistle, vocals) have had a strong musical partnership since their secondary school days. Able to navigate different traditions, introduce instantaneous changes of pace, and stitch together tunes and songs into an eclectic live set, The Drystones’ seemingly telepathic communication has always kept audiences on their toes. It’s no wonder they have earned themselves a nomination for the 2018 BBC Radio 2 Young Folk Award. Alex has roots in Scotland, an upbringing in classical violin, and tuition from English fiddle maestro John Dipper. Ford learnt Irish tin whistle from the renowned Grace Kelly, has developed his own style of Celtic guitar, and at university found a passion for Indian percussion. Their acclaimed 2017 album We Happy Few showcases these influences seamlessly, ranging from driving fiddle and tin whistle work in More Nyah, The Cheshire Set, and Green Mountain, to powerful songs retelling age-old stories in My Son John. Recorded in Newcastle with Will Lang and Julien Batten, the album was declared one of Songlines magazine’s ‘Top of the World’ in October 2017. Since forming in 2011 to play a last minute slot at their local festival in Priddy, they have appeared twice on the Avalon Stage at the Glastonbury Festival; played to a 9,000-strong crowd at the Glastonbury Extravaganza and supported big names such as The Elephant Sessions, Steeleye Span, and Seth Lakeman at venues across England. The Drystones’ drive to leave crowds thoroughly entertained and take their music in new directions was forged in their formative years, honing their skills busking and gigging wherever they could around Somerset. They developed as musicians interdependently, discovered the musical traditions of the UK, and eventually brought the most thrilling aspects of these traditions together with their tight musical bond. With a UK-wide album tour in spring 2018 and plans for an album to be released in 2019, The Drystones show no signs of slowing down. They are determined to take their breath-taking live sets far and wide and leave smiles on faces on the way.